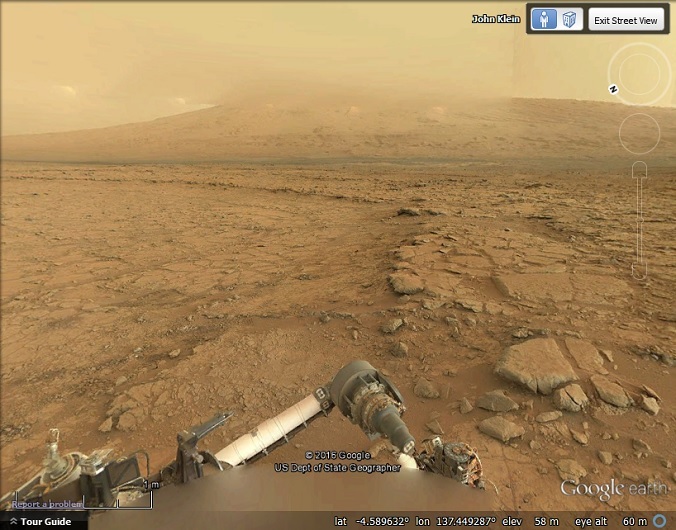 Recently, we had a look at recent additions to Street View. We also included a map of changes over the past month. There were two spots in the ‘changes’ map that we found particularly interesting. The first is in the Atlantic Ocean and upon closer inspection is very close to an underwater mountain named ‘Atlantis Seamount’. We were able to see the blue Street View indicator in Google Earth but were unable to enter Street View at that location. 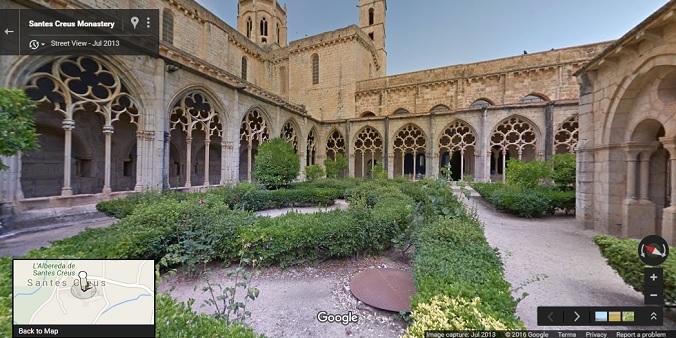 However, in Google Maps you can enter the Street View, but you get instantly teleported to Santes Creus Monastery in Catalonia, Spain. The second location is in Angola. This time we were able to see it in both Google Maps and Google Earth and it turns out to be a portal to the Moon! Portal to the moon found in Angola. If you enter Street View at coordinates -9.097507,15.484863 in Angola, you will see Lunar Street View imagery. See in Google Maps. 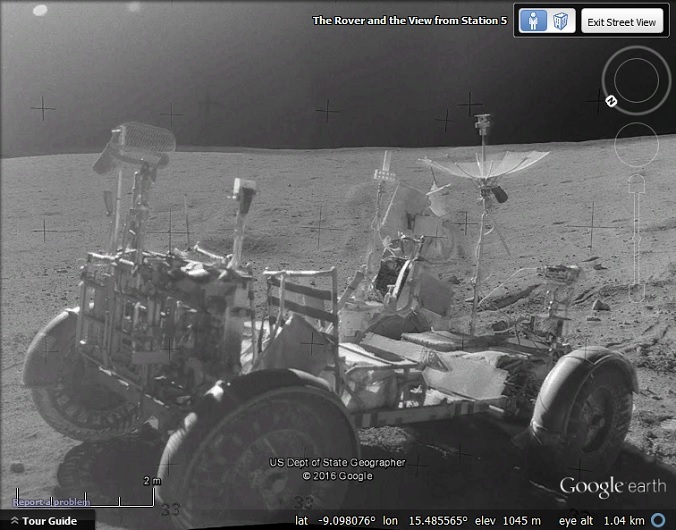 We had heard about both Lunar and Martian Street View imagery before. Thank you to GEB reader ‘poli’ for giving us a link to a Martian image in the comments of this post. We had previously not managed to find a way to view it from within Google Earth. 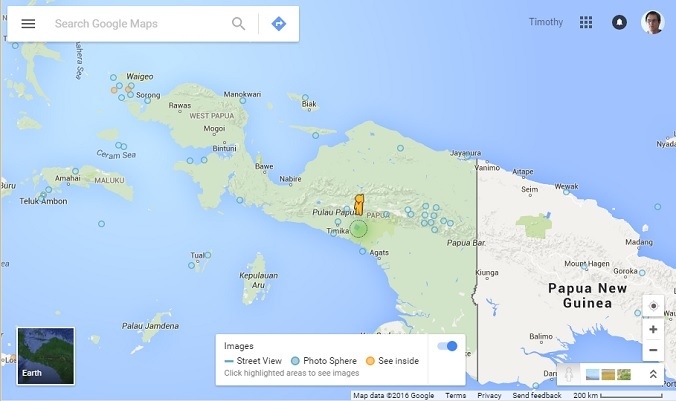 After we knew what to look for, we tracked down the Martian portal in the province of Papua, Indonesia. The portal to Mars can be found at coordinates -4.5895946,137.4492225. 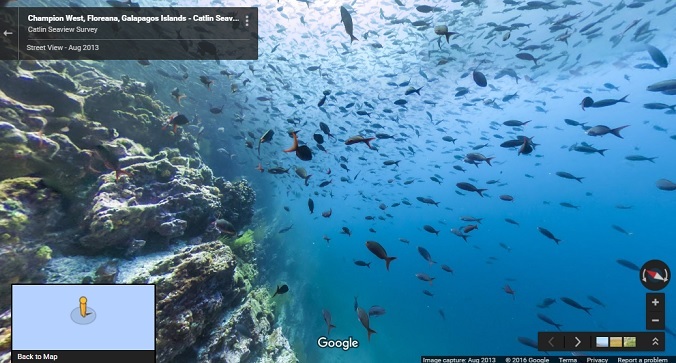 Not far north of the Atlantis portal, in the Atlantic Ocean at coordinates 40.571082, -29.539372, there is another Street View portal that takes you to underwater Street View of the Galapagos Islands. To view the Mars and Moon locations in Google Earth download this KML file . You cannot view Street View in the ‘Mars’ or ‘Moon’ modes of Google Earth or Google Maps because the ‘yellow man’ is not shown. As we have mentioned in the past the blue Street View layers tend to show different locations at different zoom levels and the blue markings for the above locations can only be seen when zoomed out quite a long way and not at all in Google Earth for the ‘Mars portal’. In order to see the blue Street View outlines when zoomed out, first zoom in until you see the yellow man, hold him above the map and then zoom out with the ‘-‘ key on the keyboard. You can also move around with the arrow keys. If anyone knows of any Street View on Mars or the Moon other than the two photospheres featured above, or if you know of any other portals where entering Street View in one location takes you somewhere totally different, please let us know in the comments. I wish you would FIX google earth for Linux. It cannot be installed on Debian anymore. I’ve been using it since 2004, also. But I’ve NEVER EVER Heard of It (or Used It) under the name of Keyhole! ps .. When I first Installed It, GOOGLE EARTH was a NEW Thing By Google! … But as I said above, I NEVER EVER heard of it as KEYHOLE! I installed GOOGLE EARTH PRO (Now Free) from https://www.google.com/earth/explore/products/desktop.html on my New Desktop, a couple of hours ago. It worked Perfectlywhen I Downloaded it: However, when I Opened It again (after having my Computer Tuned Off for a short time, I was Unable To Open It. I get a Screen requesting me To Log In with a Username and Password (but I wasn’t asked to Create a Username or Password when I Downloaded It). There is an Option to Request a FREE TRIAL, and also an Option to Purchase Enhanced Versions. What Is happening!? … It Says that it Is NOW FREE on that Website I posted above. When It is Advertised as FREE, that means It Is FREE; Not a Free Trial. If it is meant to be a Free Trial, then THAT should Be Stated on The Link! Use any email address and key GEPFREE.